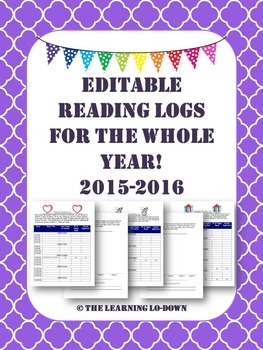 These are monthly reading logs for the entire year that can be edited to fit your school schedule with holidays and vacations. 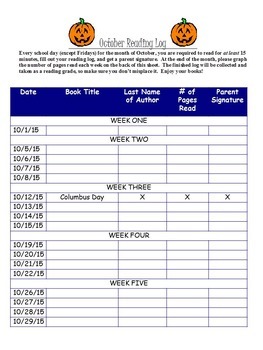 Each month your students are given a reading log where they are required to read for at least 15 minutes (the amount can be changed) every Monday-Thursday. They write down the title of the book, the author, the number of pages read and then they get a parent's signature. 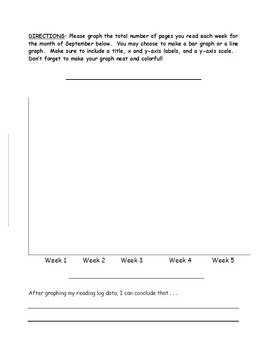 At the end of the month, there is a graph on the back where students graph the number of pages they read each week and draw a conclusion from the graph. Included are the reading logs for August 2015-July 2016, graphs, and an example graph that has been completed. 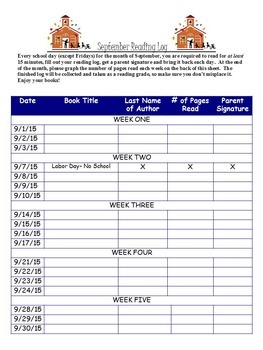 This is a great way to get kids reading all year and to hold them accountable for their nightly reading homework.